Description: Apple White is destined to be the next queen of Ever After and must find ways of improving the kingdom, but before she can do anything, she has to get a new haircut. 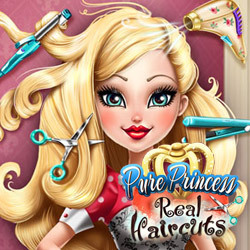 Help this Royal redefine her signature look in the salon by putting your styling skills in action. Cut, dye or make the lovely locks grow back, pick a fantastic outfit with cute accessories and Apple White will be ready to become the ruler she was meant to be.